Can You Sail to the North Pole? Blog / Can You Sail to the North Pole? Those who are truly looking to experience it all, whether it’s visiting the seven continents, taking part in bucket-list adventures like swimming alongside sea lions and marine iguanas in the Galápagos, or hiking Peru’s Inca Trail then mingling among penguins in Antarctica, may be wondering...what’s next? How about the North Pole? It may sound like a Christmas movie or a children's fantasy, but experiencing the North Pole is a reality. Not only is it possible to sail to the top of the world, this once-in-a-lifetime expedition is best experienced via cruise. Experience the northernmost point on the planet on an authentic Arctic adventure. While you won't see Santa's workshop or mingle with any elves on your trip to the North Pole, you will enjoy incredible wildlife, unforgettable vistas, adventurous activities and interesting cultures in a remote part of the world that few others have ever visited. There's a very good chance you'll also catch a glimpse some of the fascinating Arctic animals that call this frigid region home including polar bears, seals, walruses, whales and a variety of Arctic seabirds. Interact with the locals on a North Pole adventure. Opportunities for traveling to the North Pole is limited–cruises only happen in the summer months (typically June and July)–as the thickness of the polar ice prevents ocean travel the rest of the year. And with only a small number of expedition cruise lines and North Pole itineraries each season, we strongly recommended you book your adventure early, approximately 12-18 months in advance. Sailings to the North Pole, or close to it, usually start within the Arctic Circle from cities like Murmansk, Russia or Helsinki, Finland. Insider Tip: Franz Josef Land–an environmentally important nature reserve within the Russian Arctic National Park–is a great place to spot wildlife in the Arctic. This archipelago of 191 islands is so remote and difficult to reach that it wasn’t even discovered until after the continent of Antarctica. Wearing the right clothes is essential for a comfortable trip as well, though packing a bulky parka won’t be necessary as it’s included in the cost of most expeditions. Waterproof boots will be loaned and, depending on the cruise line, other polar equipment will be provided, but it's best to bring your own cold weather gear, warm jackets, layered thermals, and waterproof essentials, plus cameras and anything else you'll need to best enjoy this once-in-a-lifetime experience. Whether on land or at sea, you'll experience the unspoiled, untouched Arctic. Which Cruise Lines Visit the North Pole? As expedition cruises grow in popularity, there are more offerings than ever before. However, only a few cruise lines truly specialize in authentic polar travel. While even fewer actually take you to the North Pole itself, many get close and allow you to experience the Arctic Circle up-close-and-personal including Lindblad Expeditions, Hurtigruten, Zegrahm Expeditions, UnCruise Adventures, and even luxury brands like Silversea and Crystal's newest expedition ship - the Crystal Endeavor - have elegant voyages through the Arctic. If you want to set foot on the North Pole itself and walk in the footsteps of the world's most famous explorers, our Insider Pick is Quark Expeditions - one of the only cruise lines that focus on Arctic travel and provide the true North Pole experience. One of the leaders in Arctic adventure, Quark Expeditions features a North Pole voyage for true adventurers aboard the world’s most powerful nuclear icebreaker: 50 Years of Victory. This impressive North Pole Ship from Quark Expeditions has the highest ice rating on Earth, as it’s the first icebreaker with a spoon-shaped bow that’s capable of breaking through ice up to 8.2-feet-thick. 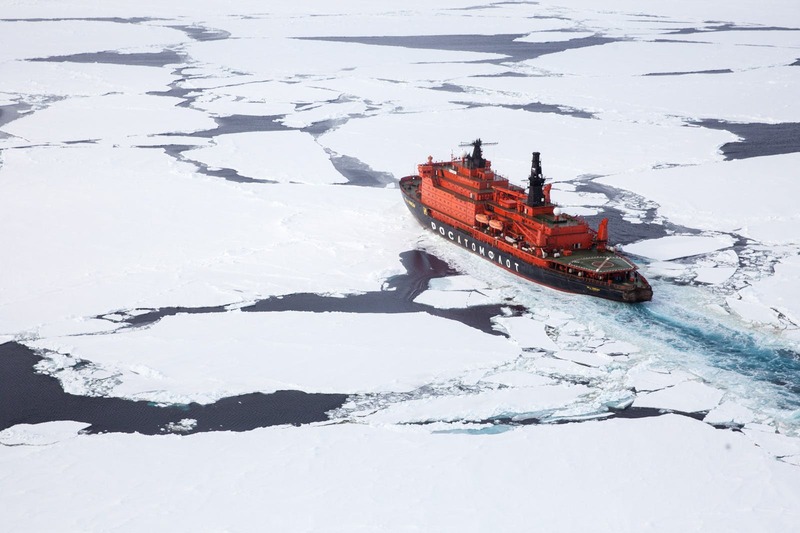 Twenty years in the making, 50 Years of Victory is one of the world’s largest, most-powerful nuclear icebreakers. A ship like no other, 50 Years of Victory is the first Arktika-class icebreaker and capable of getting into places where other expedition vessels simply can’t. The ship also comes equipped with a helicopter for "flightseeing", a hot air balloon to provide a bird's eye view of this beautiful destination and a variety of adrenaline-pumping shore excursions. Insider Tip: Quark's North Pole voyages come with the ultimate thrill of a lifetime: standing at the top of the world at 90 degrees north. You'll celebrate with a party on the bow, complete with dancing and vodka under the midnight sun. 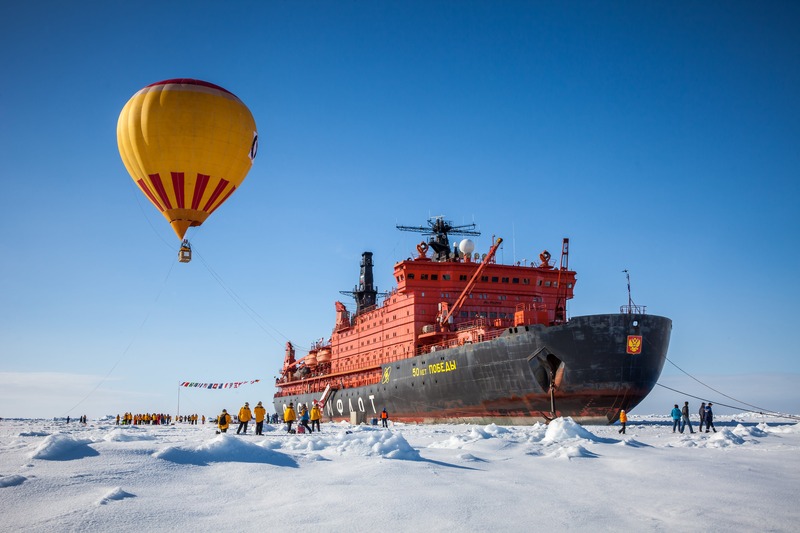 Quark Expeditions hosts the 13-Night North Pole: The Ultimate Arctic Adventure Expedition from Helsinki with two trips in 2019, including June 12 and June 23 departure dates. 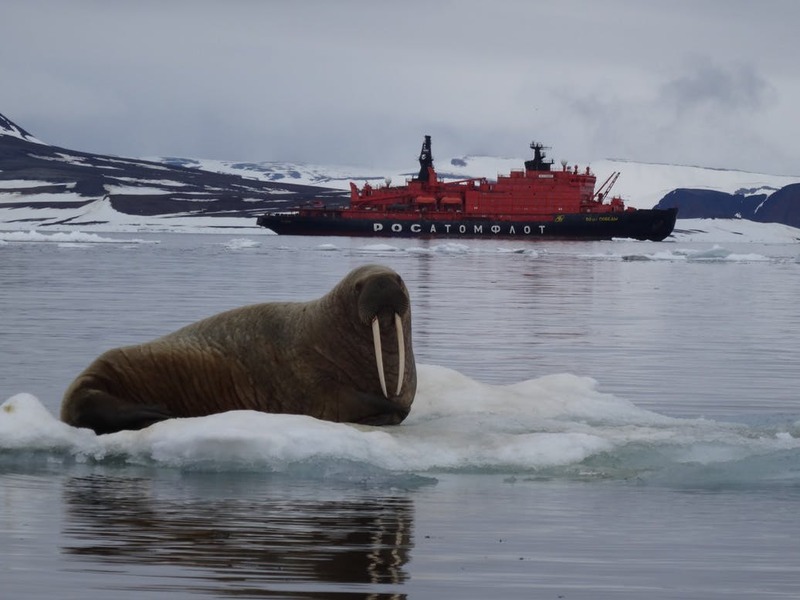 Early summer is the best time to see the wildlife, ice and snow as the midnight sun hasn’t melted the ice yet, which means walrus and polar bears will be hunting along the ice edge and birds are returning to breed. 50 Years of Victory is a ship unlike any other, with the ability to go where other ships cannot. Onboard the powerful 50 Years of Victory ship, you’ll be able to experience the incredible feeling of crushing through ice – an experience that’s unique to North Pole expeditions. Every Quark Arctic voyage also includes great daily outdoor activities including Zodiac cruises, hiking and some also offer snowshoeing, expert diving adventures, helicopter rides and even hot-air ballooning. 50 Years of Victory includes a host of polar exploration tools and technology. While you may be cruising through one of the planet’s most remote regions, the vessel offers plenty of modern luxuries. Standard cabins feature a lower berth, sofa bed, TV and DVD player and a private bathroom with a shower. Suites add a spacious bedroom, sitting room and bathtub inside of the private facilities. The icebreaker also includes a swimming pool, volleyball court, gym, music salon, massage facility, a clinic with a doctor onboard and a restaurant that serves a variety of food and drink. Insider Tip: Polar plunges into the frigid waters are par for the course on a North Pole Cruise. If conditions permit, soaring high above the white-blanketed landscape on a hot air balloon ride may be possible, too. 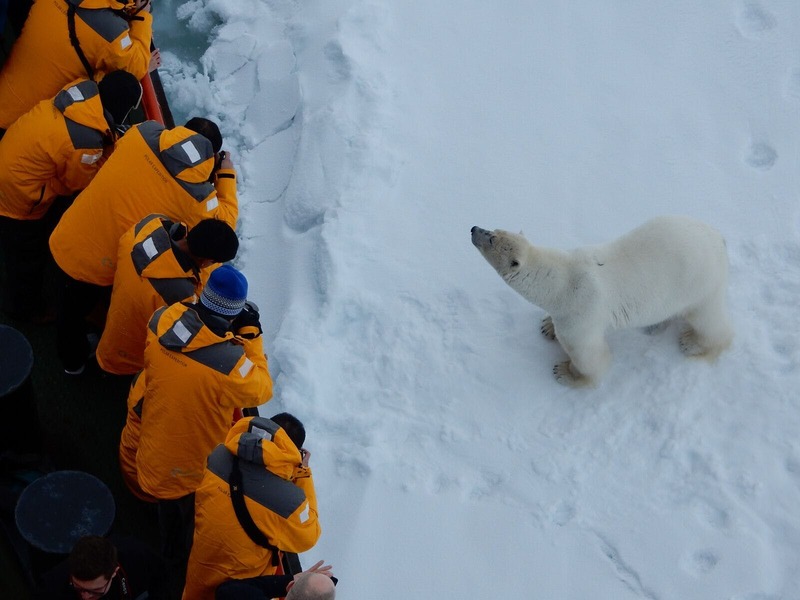 Embracing the unexpected is part of the excitement and thrill of a North Pole cruise adventure. Itineraries may change based on weather conditions or wildlife sightings, and every day is a new adventure dictated by this dramatic region. When weather permits, Quark takes you up for a breathtaking bird's eye view of 90° North in a hot-air balloon. Imagine standing at the top of the Earth, glass of champagne in hand – and everywhere you look is south. To experience 90º North, retrace the footsteps of early explorers, see the world's most remote wildlife (and possibly catch a glimpse of Santa's sleigh), contact a CruiseInsider expedition expert today. To learn more, speak to a CruiseInsider expert at 1 (877) 734-6858 for details on the latest North Pole cruise offerings.